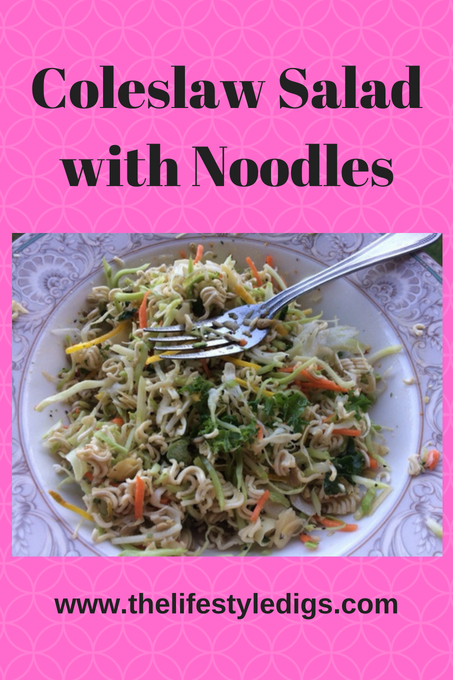 One of my go to salads any time of year is coleslaw salad with noodles. 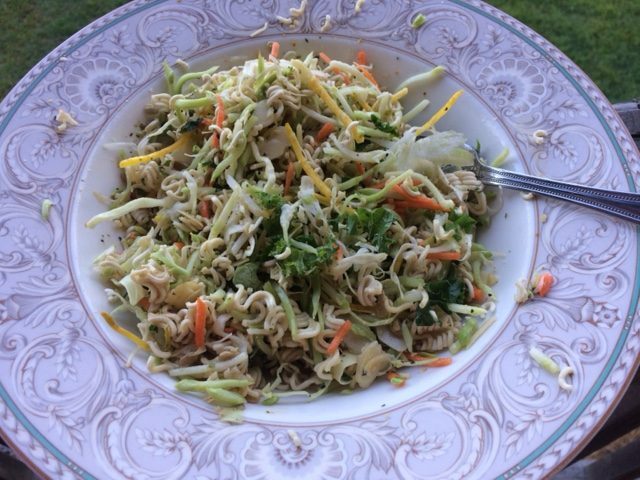 With hot summer days upon us and no one needing a hot oven making a hot house even hotter, coleslaw salad with noodles is a great dinner choice. Almost every time I shop I buy either a bag of spinach or coleslaw salad. I usually pick them up at one of the produce stores I frequent, Fruiticana or the Langley Farm Market, but I also might grab a bag at the Real Canadian Superstore. They have a coleslaw salad with kale and broccoli, so I’m always up for adding a few more veggies to my diet. I don’t usually have spinach and coleslaw in my fridge at the same time. I’m single and if I have too much salad or any type of vegetable it might go bad before I can eat it. If I’m going to buy a bag of spinach or coleslaw, I’ll be eating that every day either for lunch or dinner until it’s used up. Good thing I like them! Sometimes I like to mix it up a bit. I usually eat the coleslaw the traditional way at lunch, mixed with lemon pepper and mayonnaise. The times when I decide to make a dinner out of it, it becomes coleslaw salad with noodles. I almost always have instant noodles in the house. They make a nice quick lunch, but I’ve discovered they make a great addition to a coleslaw salad. It doesn’t matter what brand of instant noodles. I always buy vegetarian flavor and I often buy Walmart’s Great Value brand but I also like Mr. Noodles. Nothing wrong with the more expensive Ramen Noodles, other than they’re more expensive than other brands that I like just as much. Or mix it up yourself. I don’t always have green onions in the fridge (but I might in the freezer! ), so I just leave them out. This is the type of salad that you put together when you’re feeling hungry, so you’ll need a decent sized bowl to mix it up. Even better if you can eat the coleslaw salad with noodles right out of the bowl. 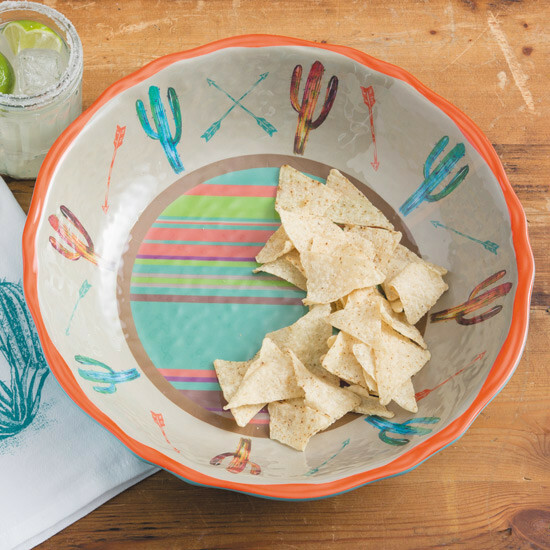 How about putting your coleslaw salad with noodles into one of these cute cactus themed bowls? 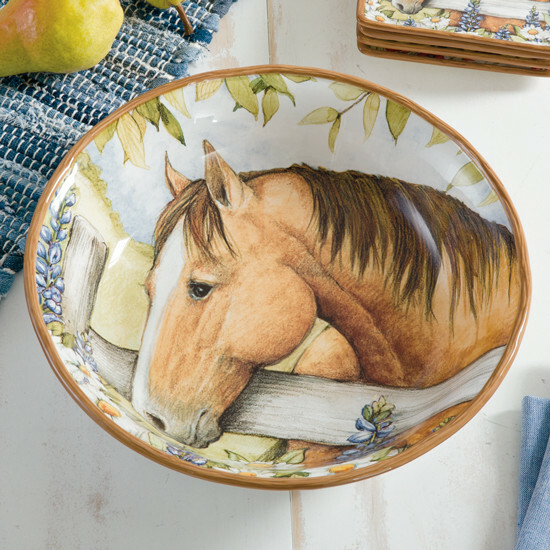 And I’m totally loving this horse bowl from Rod’s. Finish off your salad and uncover this little cutie! I know, I know, I got a little off topic. I just love western themed home decor. If you’re thinking of buying anything from Rod’s, usually there’s a pop up banner to click on to get $10 off your purchase. OK! Back to the coleslaw salad with noodles. The first thing I do is get a glass and a tablespoon to make the dressing. My measurements will be a little over or under a tablespoon. Mostly I just use it as a scoop. I scoop out a tablespoon (or less) of sugar into the glass. Next I put 2 tablespoons each, more or less, of vinegar and olive oil into the glass. Then I open the package of noodles and take out the seasoning packet, open it, and mix it into the glass. The above measurements are all to taste. If you like more sugar or less olive oil, make it your way. Using a fork, I give it a good stir and set it aside. I might even stir it a couple of more times! I pour a good amount of coleslaw into the bowl. Use your own judgement on how hungry you are. I take the noodles and crumble them up in my hands, letting them fall on top of the coleslaw in bite sized pieces. I grab a loose handful of almonds and a loose handful of sunflower seeds and add them to the coleslaw. I give the salad dressing another good stir and then pour it over the coleslaw noodle salad. Now, I know what you’re thinking here. Oil and vinegar on a coleslaw salad! That’s just so wrong! Coleslaw salad always has mayonnaise. I was a little wary the first time too, but I’m used to this now. Trust me on this. This coleslaw salad with noodles is a different kind of tang. Toss the salad. If you have green onions use a scissor and cut some as toppers. Now for the best part – eat it! This works well for me as a single, except I usually have to make another one of these salads a couple of nights later before the coleslaw turns. If you’re feeding more people, increase the coleslaw, add a 2nd package of noodles and increase the other ingredients. Let me know how this turns out for you.